The 5th semi-annual #SFFpit Twitter pitching event took place on June 23rd, 2016. As always, I used the Twitter API to capture all of the pitches, which paint a picture of the current body of aspiring SF/F writers. I had a crazy June, and thus wasn’t able to promote the event as much as I wanted to. The event was a week later than last year, presumably in a busier time. #PitMad took place just two weeks earlier. 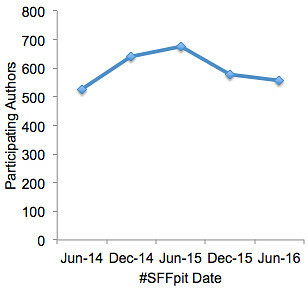 However, it seems apparent that author participation in #SFFpit is trending downward. I can’t help but notice that this coincided with the “rule change” when we asked authors to pitch only 10 times, and not to retweet their friends’ pitches. That makes the feed easier to follow, but it diminishes the signal boost from authors and their supporters. Bottom line, I’m considering lifting the no-retweeting rule for next time. Contest fatigue may also be a factor. I’ve discussed with Michelle Hauck and others who organize pitching contests, who have also noticed it. When I started #SFFpit in 2014, there were exactly two other Twitter pitching events: #PitMad and #AdPit. 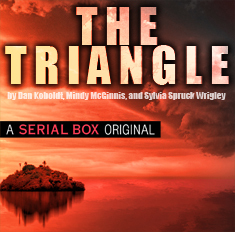 Neither emphasized SF/F, which is probably why #SFFpit grew so quickly. Now, there are dozens of Twitter pitching events, and the number continues to grow. I don’t feel right complaining about this — my right to host a Twitter pitching event is the same as anyone else’s — but I feel like the space is getting a little crowded. The timing and the inundation of Twitter pitch parties may be why literary agent participation seemed lower in June, too. About 14 literary agents showed up to make requests, which is less than I’d hoped for. The result is that a growing share of #SFFpit requests come from small press editors. Some are legitimate operations that actually publish books and pay their authors. Others, I can’t vouch for. On the bright side, we did have some new participating agents from top-notch agencies, including JABberwocky and Donald Maass Literary Agency. Now, down to the stats. These numbers are based on 3,173 tweeted pitches that took place during the contest window. If a pitch didn’t have an age category hashtag, I counted it as adult, which may skew that category slightly. 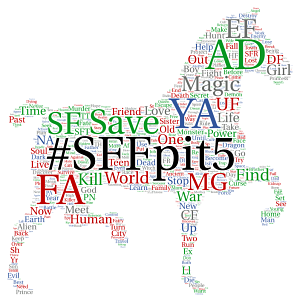 Young adult (YA) continues to dominate #SFFpit, representing half of all pitches. That’s more than adult (31%) and middle grade (13%) combined. We had a small turnout of new adult (NA) and picture book (PB) projects as well. 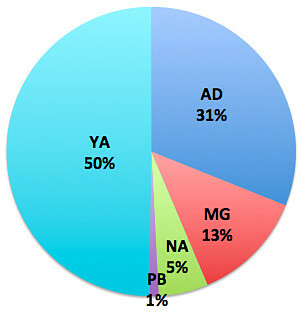 Fantasy represents the majority of pitches, with epic fantasy (EF) and urban fantasy (UF) as the two most popular subgenres. 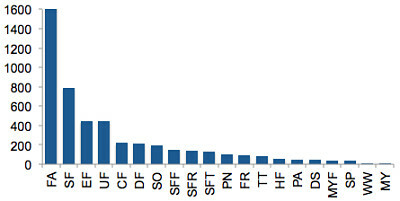 Half as many pitches were labeled sci-fi (SF), where the most popular subgenre was space opera (SO). Other popular subgenres included contemporary fantasy (CF), dark fantasy (DF), sci-fi romance (SFR) and sci-fi thriller (SFT). 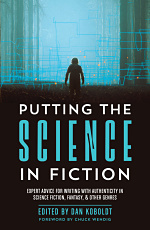 I’m sure that some of the authors who participated in #SFFpit will land representation. For the rest, I’d like to make a plug for Pitch Wars, a contest in which published/agented authors, editors, or interns choose one writer each, read their entire manuscript, and offer critiques on how to make the manuscript shine. Last year about 125 authors were selected by a Pitch Wars mentor, and at the time of writing, more than 50 of them have received an offer of representation. That includes my 2015 mentee, Michael Mammay, who’s represented by Lisa Rodgers of JABberwocky and joining me as co-mentor this year. We’re looking for adult SF/F; check out our mentor bio and wish list for details. Yeah, summer’s a rough time to schedule anything. But I can’t believe how many generalized Twitter pitch parties there are now, and how often they occur. I think reducing their frequency would help (like once annually rather than once every couple of months or twice yearly), but that might lead to more general Twitter pitch parties “filling up the gap” and drowning out the specialized ones. I’m considering doing pg70pit biennially.